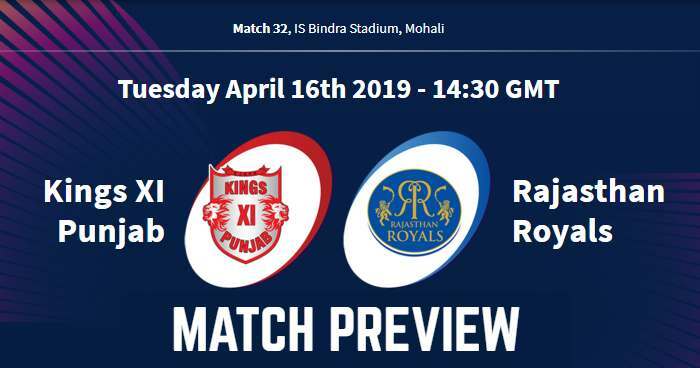 Kings XI Punjab (KXIP) and Rajasthan Royals (RR) will be playing the 32nd match of the 12th season of Indian Premier League - IPL 2019 on 16th April 2019 at IS Bindra Stadium, Mohali. As far as weather is concerned, the rain can ruin the match. There can be rain mainly later in the game and the temperature will be around 25°C. It is a beautiful evening for cricket. An even covering of grass. The average score in the last five IPL games is 175. It looks good for batting. Little mosaic looking. It is a little bit challenging to hit sixes on this ground because of the dimensions. For Kings XI Punjab, David Miller and Hardus Viljoen will be replacing Nicholas Pooran and Andrew Tye respectively. For Rajasthan Royals, Ashton Turner can replace last match debutant, Liam Livingstone. In last 5 matches between them, Kings XI Punjab have won 3 matches and Rajasthan Royals have won 2 matches. In IPL 2019, last they met on 25 March 2019 at Sawai Mansingh Stadium, Jaipur; where Kings XI Punjab beat Rajasthan Royals by 14 runs, this was the first defeat for by KXIP at Jaipur. Kings XI Punjab and Rajasthan Royals have met 6 times at IS Bindra Stadium, Mohali. Out of 6 six times, KXIP and RR have won 3 times each. Kings XI Punjab have a 3-1 win-loss record in matches at IS Bindra Stadium, Mohali in IPL 2019. The Rajasthan Royals captain Ajinkya Rahane has been very lucky at coin-tosses; he’s won 5 of the 7 tosses this season and Ravichandran Ashwin has won only 3 tosses in 8 matches. Jos Buttler has scored half-centuries in his last four innings against KXIP. Steve Smith and Chris Gayle have strike-rates of 94.25 and 96.22 respectively against spinners this season.